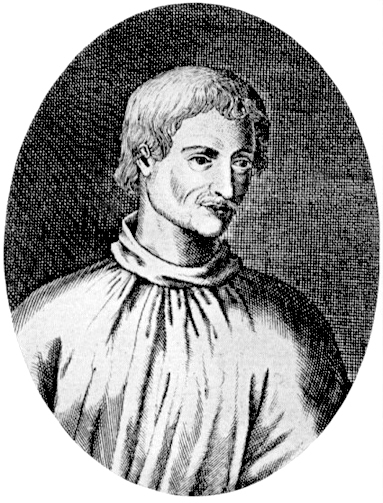 Giordano Bruno, born Filippo Bruno in Nola, Campania, was an Italian philosopher, priest, Copernican cosmologist, occultist, mnemonicist, and iconoclast. Bruno’s philosophical and scientific views were profoundly influenced by the ideas of Arab astrological magic, Neoplatonism and Renaissance Hermeticism. His 35 published works include Ars Memoriae (The Art of Memory, 1582), De Magia (On Magic, 1589-90), Theses De Magia (Theses On Magic, 1589-90), De Vinculis In Genere (A General Account of Bonding, 1589-90), an De Imaginum, Signorum, Et Idearum Compositione (On The Composition of Signs, Images and Ideas, 1591). During his lifetime, he managed to be excommunicated by the Catholics, Calvinists and Lutherans for his unorthodox ideas. In 1600 e.v., He was burned at the stake by the Inquisition of Rome on charges of blasphemy and heresy. He is widely considered to be a martyr for early scienctific views regarding cosmology; particularly the ideas of heliocentrism and the infinity of the universe. On Feb 17, 2000 e.v., without formal announcement, the Frater Superior added Bruno to the list of E.G.C. Saints, in commemoration of the 400th anniversary of Bruno’s martyrdom. Bruno’s name is placed between those of Robertus de Fluctibus and Johannes Dee, and is not italicized. Couliano, Ioan, Eros and Magic in the Renaissance. Chicago: University of Chicago Press, 1987. Yates, Frances, Giordano Bruno and the Hermetic Tradition,Chicago: University of Chicago Press 1964. Also see these articles: Wikipedia: Giordano Bruno, Thelemapedia: Giordano Bruno.